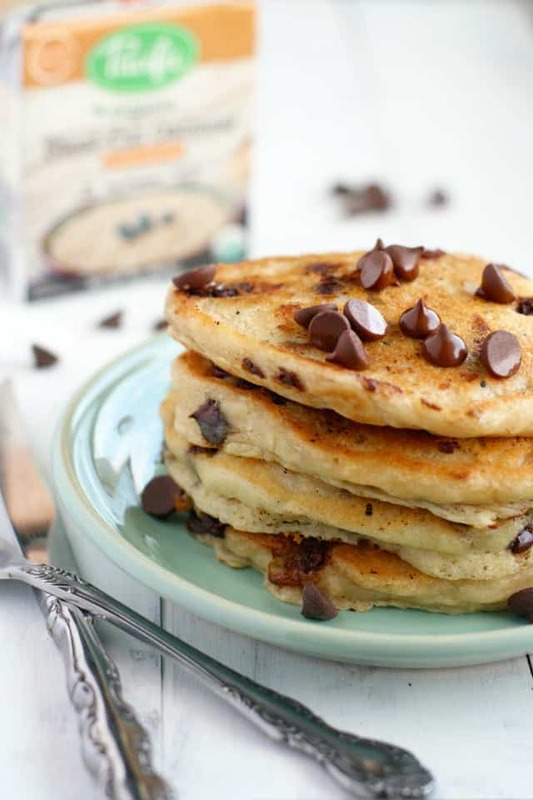 Home » Breakfast » Vegan Oatmeal Chocolate Chip Pancakes. Vegan Oatmeal Chocolate Chip Pancakes. There’s nothing like a big stack of vegan oatmeal chocolate chip pancakes to start your weekend! This recipe is quick, easy, and makes the best vegan pancakes! Disclosure: This post is sponsored by Pacific Foods. As always, all thoughts and opinions are my own. Thank you for supporting the brands that support me! What are your favorite breakfast foods? Pastry? Waffles? Pancakes? Mine is light and fluffy pancakes, and also a hearty bowl of oatmeal. And if you combine the two, well, that’s just perfect in my book! We love our steel-cut oats in this family. The only drawback is that it takes a little bit of time to make them. When we wake up super hungry, we don’t always feel like waiting the 20 minutes that it takes to boil some steel-cut oats. 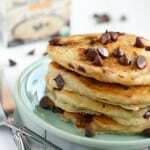 One shortcut that you can take when making these vegan oatmeal chocolate chip pancakes is to use boxed, cooked steel-cut oatmeal from Pacific Foods. Pancakes are fairly quick to make, and if you can add some ready-to-eat organic steel-cut oatmeal, you’re adding healthy fiber without taking up a lot of extra time. We love our oatmeal around here, and we really LOVE our pancakes, so vegan oatmeal chocolate chip pancakes? A match made in heaven for us! These are so easy to make, and really delicious for a weekend breakfast or brunch. It was very easy to incorporate the steel-cut oats into this recipe, and I felt good knowing that we were getting some extra whole grain in our pancakes. 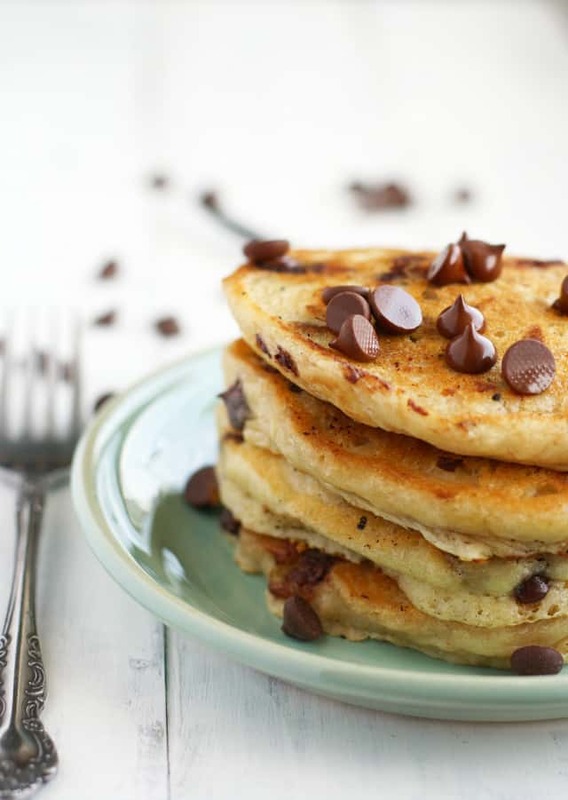 These pancakes are fluffy, tender, and loaded with melty chocolate chips. The oats provide extra fiber, iron, and protein. You need to make these soon! And if you’re on a pancake kick, you’ll want to give these fluffy vegan banana pancakes a try, too! Vegan Chocolate Chip Oatmeal Pancakes. 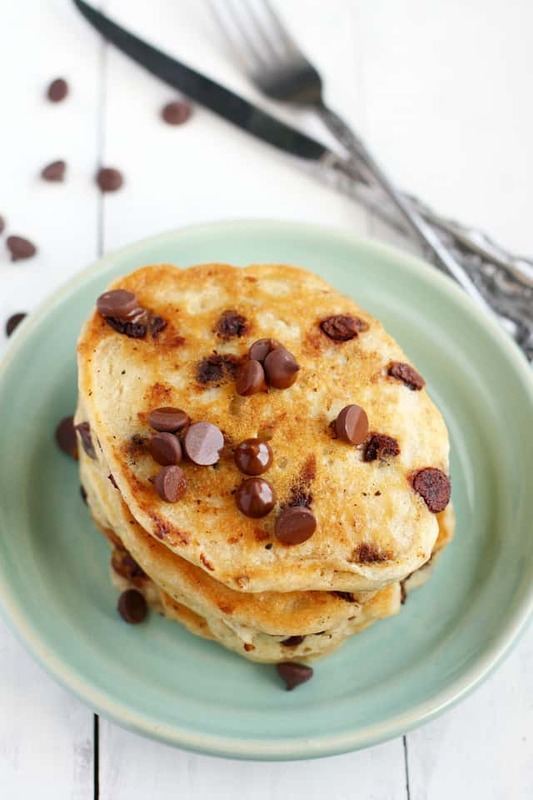 Delicious vegan oatmeal chocolate chip pancakes are a healthy way to start your day! In a large bowl, whisk together the white spelt flour, baking powder, salt, and cinnamon. Add the organic canola oil, non-dairy milk, vanilla extract, and cooked steel cut oatmeal. Stir to combine. Add the chocolate chips and stir to incorporate. Set aside for a few minutes - you will see the batter puff up from the baking powder. Put a tablespoon of vegan buttery spread in a skillet and heat over medium heat. Once the vegan buttery spread is sizzling, spoon the batter into the pan. Reduce the heat slightly. Watch the pancakes closely - when the edges are starting to firm up and look cooked, use a spatula to flip the pancakes carefully. Cook until pancakes are golden brown, about 3-4 minutes on each side. Add more vegan buttery spread to the pan between each group of pancakes. Serve with more chocolate chips, powdered sugar, or pure maple syrup. Could I replace the coconut milk with almond milk and the canola oil with a banana? Love your website and these vegan pancakes look amazing! 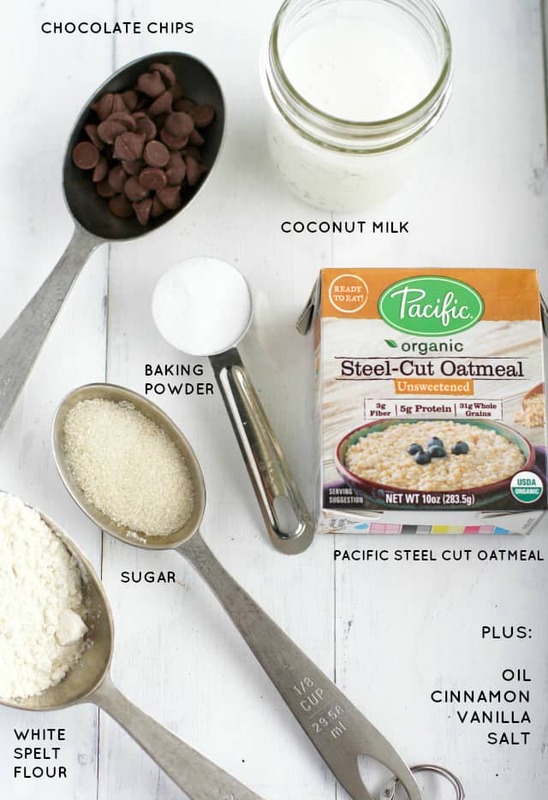 I noticed that the recipe calls for “Pacific Organic Steel-Cut Unsweetened Oatmeal” – judging by the photo you used ready-to-eat steel-cut. Can regular steel-cut be substituted? Perhaps the recipe could indicate (pre-cooked or ready to eat)? Thanks for posting so many mouthwatering photos! Yes, you can definitely use cooked steel cut oats that you make yourself! Good point, I will have to indicate that in the recipe. These look so good! I am excited to try this and the blueberry ones too. I just started a similar blog because I am trying to push myself to try new things. I will definitely give your props for this one if I post about it. Your blog looks amazing. Well done! Do you have any suggestions for reducing or substituting the oil? You can try reducing it, I have not tried that though. I would not sub in applesauce, because these are already very moist with the oatmeal. Any suggestions for reducing or substituting the oil? So the steel cut oats are gluten free? These look delicious! I cannot have spelt, would a gluten free all purpose flour work? Also, living in Canada we don’t have those yummy looking steel cut oats?? ?would any instant oats work? Yes, any instant oats would work. I haven’t tried these with GF flour, but I think it would be okay although it may take longer to cook. Let me know if you try it! Hi, I do not eat corn and baking powder contains cornstarch. What can I substitute for baking powder? Suggestions? We use Featherweight Baking Powder which is corn free. We don’t eat a lot of corn over here, either. My son was very sensitive to it for a while. These pancakes will be perfect for my family’s Sunday morning pancake breakfast tradition – love that they are vegan! Your pictures are always amazing Kelly! Especially since chocolate chip pancakes are one of my favorite treats! Thank you so much, Emily! You are too kind! Ah pancakes ;) And always with chocolate in some form! Chocolate + pancakes = YUM! I can hardly stand how soft and fluffy these pancakes look! LOVE the idea of adding steel-cut oats to them! Must try that. :) My family would love these! These pancakes look mouthwatering, Kelly! Love the chocolate chips and oatmeal in here!